Lama Zopa Rinpoche, Madrid, Spain, November 2018. Photo by Ven. Lobsang Sherab. 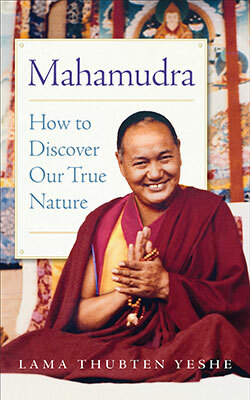 —New Book by Lama Yeshe! 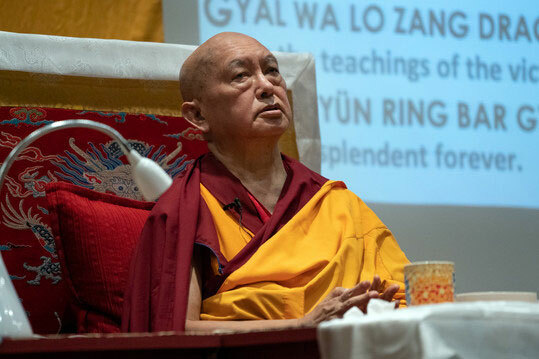 Lama Zopa Rinpoche while teaching in Madrid, Spain, October 2018. Photo by Harald Weichart. 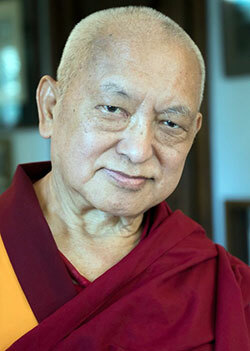 Lama Zopa Rinpoche is teaching in Switzerland this weekend! Watch live! 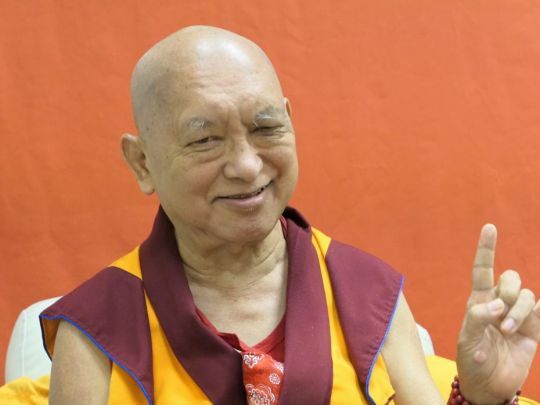 Find recordings of Rinpoche’s recent teachings via Rinpoche Available Now. Lama Zopa Rinpoche giving a talk in Madrid, Spain, October 2018. Photo by Ven. Roger Kunsang. 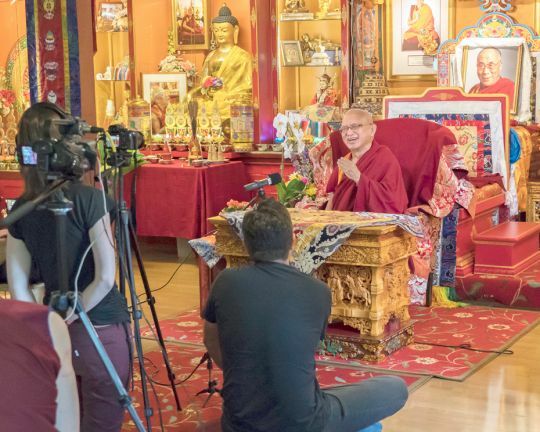 Lama Zopa Rinpoche being interview by Wisdom Publication’s Daniel Aitken for a Wisdom Podcast, Kurukulla Center, Massachusetts, US, August 2018. Photo by Ven. Lobsang Sherab. 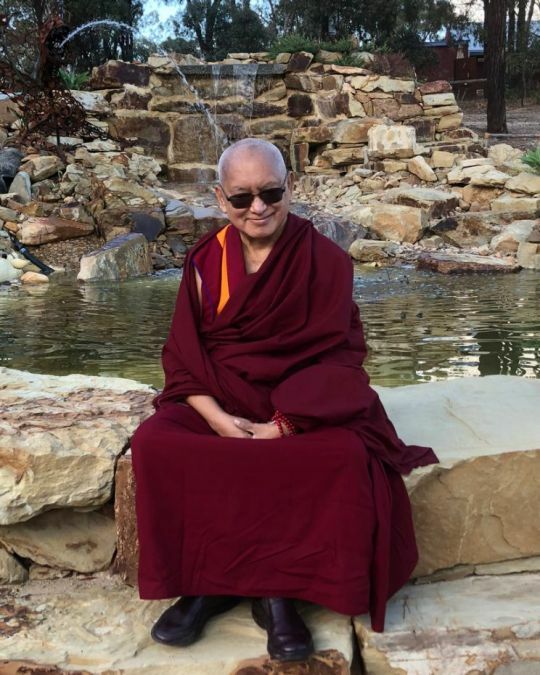 Lama Zopa Rinpoche in the Peace Park at the Great Stupa of Universal Compassion, Australia, May 2018. Photo by Ven. Roger Kunsang. We announce a new FPMT charitable project, the Protecting the Environment and Living Beings Project which was established due to Lama Zopa Rinpoche’s recent advice that specific pujas and practices should be done regularly to pacify harm from the elements such as tornadoes, hurricanes, heavy rain, storms, floods, earthquakes, fires, and so forth; and to protect those (humans, animals, insects) who are affected. Rinpoche has identified a number of specific pujas and recitations to occur monthly. Arranging and sponsoring these pujas is one of the unique ways that FPMT can benefit sentient beings. This is also an aspect of social service to others that helps address the karmic conditions contributing to seemingly “natural” occurring disasters, and those harmed by them. A great expression of generosity has brought in over US$25,000 in single donations and an additional US$11,000 in recurring donations to come each year for the FPMT Translation Fund. These resources will be used for important translations of classic texts for the FPMT Basic and Masters Programs and the 31-chapter edition of the Sutra of Golden Light. Thank you to all who offered support to these projects, and let’s all rejoice! Find out about Sacred Adornments and our related new products and special offers! 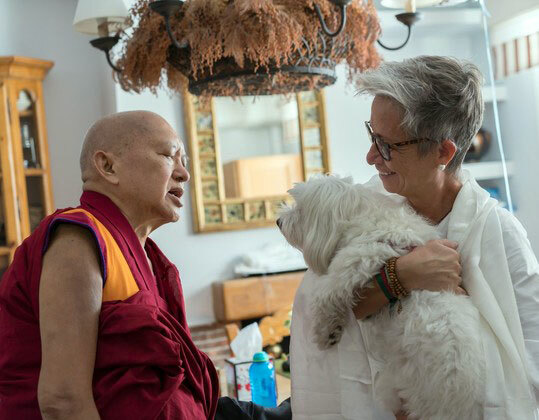 Lama Zopa Rinpoche blessing a dog, Spain, October 2018. Photo by Ven. Lobsang Sherab. The director is so central to the center, project or service, that when the time comes for a change of director, it can be a challenging time for all. A guideline to help make this challenging transition smooth and most fruitful is available in the Offering Service: Job Descriptions section of the Affiliates Area. The combination of the above and familiarization with Lama Zopa Rinpoche’s advice about offering service will all assist at this critical time. The FPMT world map in the Display Pack has been updated! The Display Pack is to enable visitors to get an instant snapshot of your heritage, wider mission, core values, international reach, and the wealth of Dharma programs available in the FPMT organization. Find that and other information To Display in Your Center, Project or Service. New Book by Lama Yeshe! 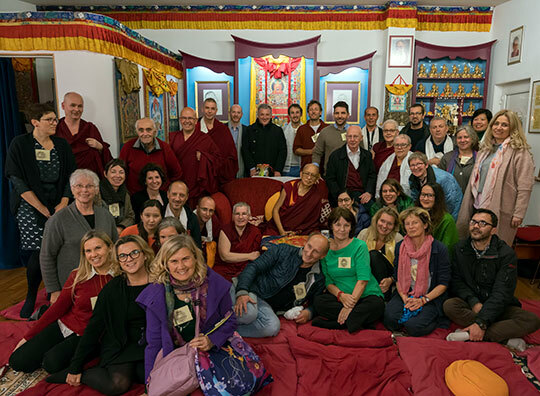 Lama Zopa Rinpoche with the directors, board members, and spiritual program coordinators from European FPMT centers, projects, and services, after their recent rewarding regional meeting hosted by Tara Mandala Center in Germany. Photo by Ven. Lobsang Sherab. Would you like to spend your days in a very meaningful way? Have a look at the regularly updated meritorious opportunities to offer service as a volunteer or as paid staff in FPMT centers, projects, and services around the world. Newly added: Atisha Center, Australia seeks a new director; Potential Project is looking for an executive assistant, a marketing project manager, a technical coordinator, and a graphic designer.